Samoled : Please don´t forget to RATE and post Comments. Thanks ! Click on my Name profile to view all my Android themes and apps available. If you need any help or wish to contact me, send me an email. I try to reply emails daily, if not possible I´ll reply in no more than 48hs. I do not reply emails in weekends, emails are replied from Monday – Friday. Refunds are available for 15 minutes, if you wish to cancel the order do it during this time. 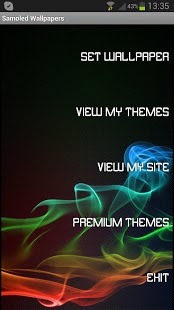 If this is a free theme you can cancel and try again several times. If it´s a paid application and you cancel it, the second time you order it no refund will be available. Samsung Galaxy Mega 6.3 It’s so beautiful app. Thanks much Admin. Its good theme for my samsung grands I really like it.